Like many other parts of our economy, the office market is going through seismic shifts in demand usage. Private offices are out, and open workspace is in. Some of the causes for this shift are technological. Twenty years ago, no one used email; instead they fielded or made about 70 to 100 phone calls a day. Today, most people field or make around ten phone calls a day and send, respond, or read 100 emails. 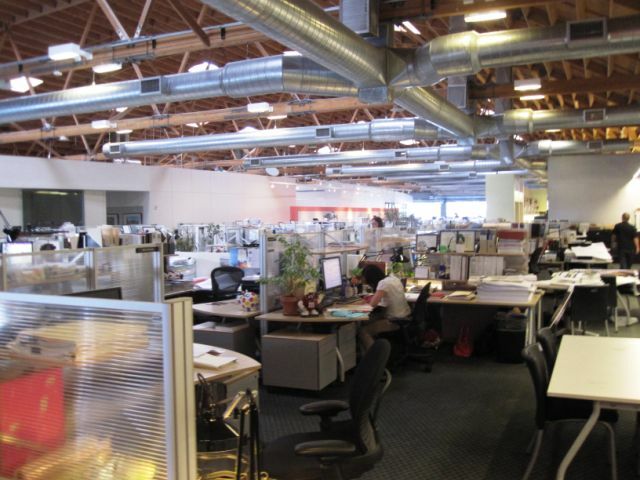 Hence, the need for private space–either in offices or workstations–has radically decreased. Digital storage has lessened the need for physical storage. Cloud based computing allows one to work anywhere. The result is fitting more people into less space and thereby reducing the demand for office space. Companies are figuring out that they can reduce real estate costs and, at the same time, create a more contemporary environment. Office owners must focus on making their space more productive to be more competitive. 1. Working in open environments with less walls and partitions. 2. More shared collaborative spaces: conference rooms, meeting rooms, break rooms, bigger kitchens and informal meeting areas. Some of these areas are also used for focused work or making phone calls for those who need private space at variable times throughout the day. 3. Amenities and Break areas: coffee refreshment areas, ping pong table, and Foosball. 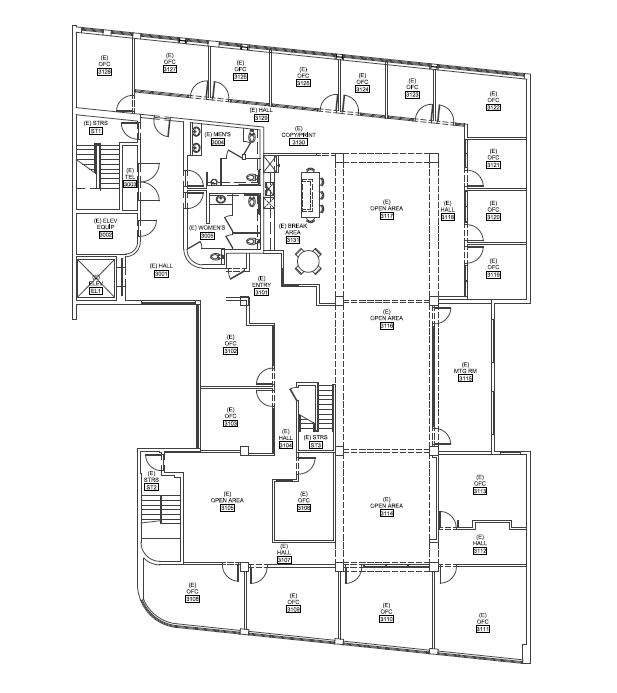 Below is an as built plan of the West Los Angeles 10951 Pico Boulevard Third Floor, excluding the mezzanine, which is roughly about 8,000 square feet. The plan shows 20 private spaces and room for about 12 workers in the open area. 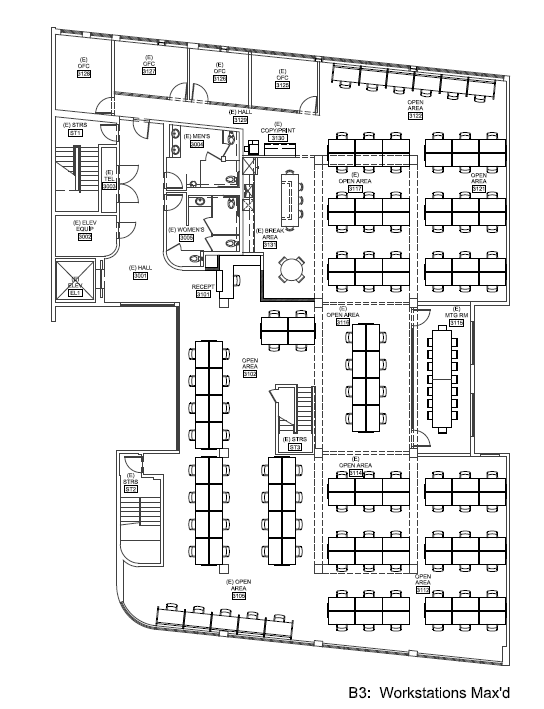 This next space study shows an extreme move to density with five enclosed areas, including a conference room and room for a 115 workers in open areas. A more optimal plan for a software company would involve a max density of 10 people per 1000 square feet. This would include more disbursed private spaces such as a small conference rooms and workrooms with computers and phones. Some open area would be converted to informal meeting and recreational areas that would bring density down to 5 to 6 per 1000, but still allow temporary scaling of people if required. Creative space helps alleviate the impact of this density, as volume and natural light give the sense of greater space despite the density. Read the full story on changing office trends from the CoStar Group’s website here. This entry was posted in Creative Office in the News and tagged 10951 Pico Blvd, CoStar, creative office, Los Angeles, new technology, office demands, office trends, PMI Properties by PMI Properties. Bookmark the permalink.